Subscribe to The Sweater with Kathleen Dames newsletter using the form at the bottom of this page and never miss an episode or special announcement. You will find links to each episode as the season progresses. 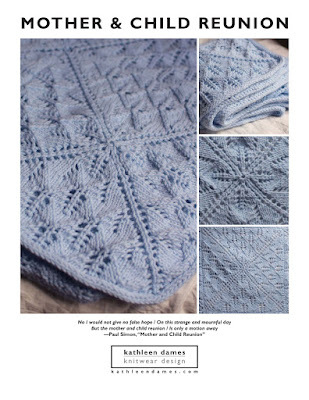 Download your copy of Enwreathed Pullover and Enwreathed Cowl from Ravelry. Subscribe to my YouTube channel, and you'll be notified when each episode is ready for you. Subscribe to the audio version on iTunes, and have episodes downloaded to your favorite device. Questions? Concerns? Just excited about your project? Post in the thread on my Ravelry group. Use the hashtags #kdsweater and #enwreathedpullover and tag me @kathleendames on Twitter or Instagram. 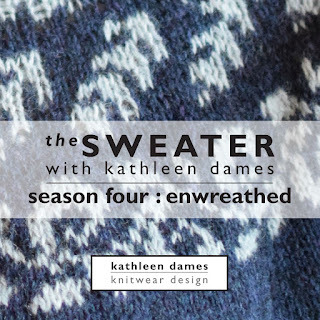 Check out The Sweater Collection: Year One for the patterns from the first three seasons. You can change your mind at any time by clicking the unsubscribe link in the footer of any email you receive from me, or by contacting me at kathleen@kathleendames.com. I will treat your information with respect. For more information about our privacy practices please visit our website. By clicking below, you agree that I may process your information in accordance with these terms.